THE HEROESONLINE BLOG | HEROESCON 2012 GUEST LIST UPDATE :: STAN LEE! HEROESCON 2012 GUEST LIST UPDATE :: STAN LEE! Heroes Convention 2012 Welcomes Stan Lee! 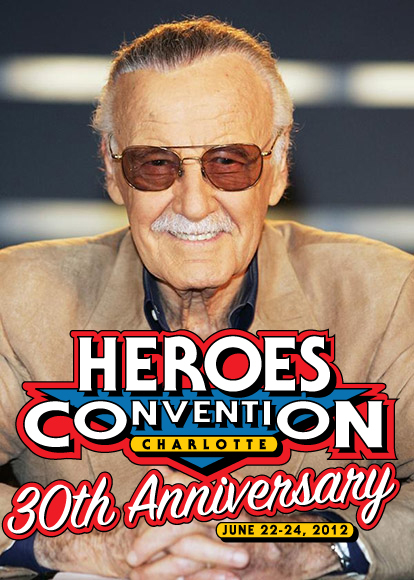 Shelton Drum is honored and excited to welcome comics legend Stan Lee back to Charlotte as a featured guest of Heroes Convention’s 30th anniversary. Stan last attended HeroesCon in 1984 and his return this summer will be the crown jewel in the show’s 30th Anniversary celebrations. Stan will be on hand signing autographs and posing for photographs during HeroesCon. He will also be featured on a panel discussion. All attendees of the convention will be welcomed to Stan’s panel, photo opportunities and autograph sessions. Details of our VIP ticket packages will be announced next Friday, May 10th! Sign up for our mailing list to get the news first! Stan Lee is known to millions as the man whose superheroes propelled Marvel to its preeminent position in the comic book industry, Stan’s co-creations include Spider-Man, The Incredible Hulk, X-Men, The Fantastic Four, IronMan, as well as hundreds of others. He introduced Spider-Man as a syndicated newspaper strip that became the most successful of all syndicated adventure strips and has appeared in more than 500 newspapers worldwide.Stan currently remains Chairman Emeritus of Marvel, as well as a member ofthe Editorial Board of Marvel Comics. Stan is currently the Chairman & Chief Creative Officer of POW! “Stan Lee has been the face and the voice of Marvel Comics since the debut of The Fantastic Four in 1961 and has in recent years become the same for comics and superheroes in general to most fans. I’m very excited and proud that Stan will be helping Heroes celebrate HeroesCon’s 30th anniversary!” said convention organizer and comics retailer Shelton Drum. This year’s Heroes Convention takes place June 22-24, 2012 at the Charlotte Convention Center. This is huge! Congrats on getting Stan Lee for the 30th anniversary. I’m really disappointed I won’t be down there to meet him! Excelsior to the whole staff! that’s incredible. hope i get to meet him. Hey! Wasn’t that guy on Big Bang Theory? So stoked!!! Thanks guys for making alot of peoples dreams come true. He’s smiling because we’re all going to be paying him $50 a signature. WHOOOHOO! Now that is what I’m talking about! THANK YOU, SHELTON! YOU ROCK! This is so awesome. Since I was a kid, I have always wanted to meet Stan. As a grown man and a father, his work has only come to mean more to me. Last year I thought about driving up to Baltimore to meet him at the convention there, but I was low on cash and couldn’t do it. Thanks so much, guys, for bringing him to us! I saw this email at work, and totally freaked out. Stan “The Man”Lee. I am so stoked about this. Got the true believer package, and finally will get to meet a hero of mine. Thank you Heroes, for making my dream come true. I missed him in San Diego 2 years ago, and have regreted it ever since. This freaking rocks !!!! I notice the Stan Lee packages are still available a week later after it was released. Could you tell us how “limited” these packages are? I know some of the other cons are limited to under 1000 passes. Just curious? Way less than 1000 are available. Thanks so much for the update AND thanks to Shelton for bringing back Neal Adams. I finally get to meet my childhood favorite this year! fingers crossed it doesn’t sell out before I can get my ticket. I have to wait till next pay check on friday. Does anyone know what days Stan Lee is going to be there? All 3 days? Just select days? Do you need to purchase tickets ahead of time to meet him? ← FREE COMIC BOOK DAY @ HEROES :: THE COMICS!